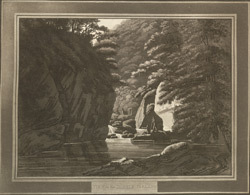 View of the Dargle River in County Wicklow, Ireland. The Dargle River rises in the Wicklow mountains and flows in an easterly direction through the Dargle valley until it meets the sea at Bray. This aquatint was published by Laurie and Whittle, Robert Laurie (1755-1836) and James Whittle (1757-1818), were well known print, chart and map sellers who were based in London.